This is a picture of the famous Gharqad tree (or Boxthorn tree in English) that will not speak out to the Muslim in the battles towards the end of time with the Jews. Khaled Al-Qudha: The decisive battle between the Jews and us will take place on the Jordan River, Allah willing. This is inevitable. This is a hadith of the Prophet, who does not talk idly. Host: Did the hadith relate to the battle’s outcome as well? Khaled Al-Qudha: Of course. “Until the Jew hides…” – because, as is well known, the Jews only fight from behind walls, when they are hiding. They don’t fight face to face. That’s why the tree and the stone will talk and say things. Host: The hadith says: “The Muslims will kill them…” So this will be a victory of the Muslims. Khaled Al-Qudha: Yes, and an overwhelming defeat for all the Jews, Allah willing. And this is not at all difficult for Allah . This battle will take place. It is inevitable. Even if we go to Oslo, and so on, the battle must take place. The Jews know this, and that’s why they plant a lot of Gharqad trees. They know the hadith. 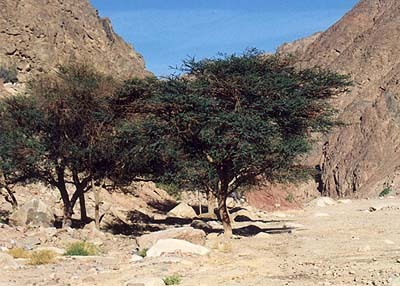 ‘Ali Al-Faqir: They surround their settlements with Gharqad trees. That explains all those Gharqad trees, but what of the stones and trees talking? Is this to be interpreted literally? But brothers, the Prophet has told us that the time will come when man will talk without using his voice – the cell-phone, the cordless phone. This cordless phone – where did it come from? From the earth. Plastic comes from petroleum. The wires, the iron, and the copper – where do they come from? From the earth. Furthermore, some communication devices are now made of wood. It is not impossible that “the tree and the stone will speak” refers to the advanced scientific instruments that warn you about people. Today you have, for example, early warning stations in Sinai. Early warning stations exist in the Golan. They give the Israelites information about the other side’s movements. Host: Sir, this is if we interpret (the hadith) metaphorically. But isn’t it possible that the tree and stone will actually talk? That the tree itself will talk, and the stone itself will talk? ‘Ali Al-Faqir: Sir, it has been proven scientifically that the trees and the stones have languages of their own. But we don’t have the ability to invent the instruments that will convey the tree’s voice and the stone’s voice to us. It would be a very interesting study to see how many of these trees have been planted in Occupied Palestine by the Yahood. Posted on August 5, 2014, in ARTICLES and tagged Allah, explains, facts, gharqad, gharqad tree, Hadith, islam, israel, jew hides, jews, khaled al qudha, muslims, palestina, prophet muhammad, Prophet Muhammed, rocks, science, servant of Allah, stones, the, the hadith of the gharqad tree, the hadith of the gharqad tree and the jews. Bookmark the permalink. Leave a comment.